5 Canada Square is a 15-storey, 87.7 m (288 ft) office building in the Canary Wharf financial district development of London, England. 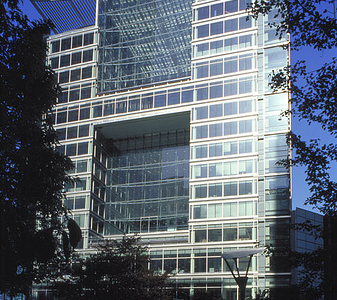 5 Canada Square was completed in 2003. The steel- framed building has an aluminum curtain wall and it features a large atrium on its south side with 46,450 m2 (500,000 sq ft) of floorspace. The principal tenant at 5 Canada Square is the European arm and HQ of Bank of America Securities. The building is used for the bank’s global cash-management business for clients. Credit Suisse also occupies part of the building. Here's the our members favorite photos of "Skyscrapers near London Borough of Tower Hamlets". Upload your photo of 5 Canada Square!